When I originally planned our route from Little Bighorn to Custer SD, I noticed Sundance WY and immediately thought of the film festival at Sundance. I was quickly corrected by the internet – Sundance WY is the “other” one. No film festival at all. The Sundance in Wyoming is the home of Devils Tower. 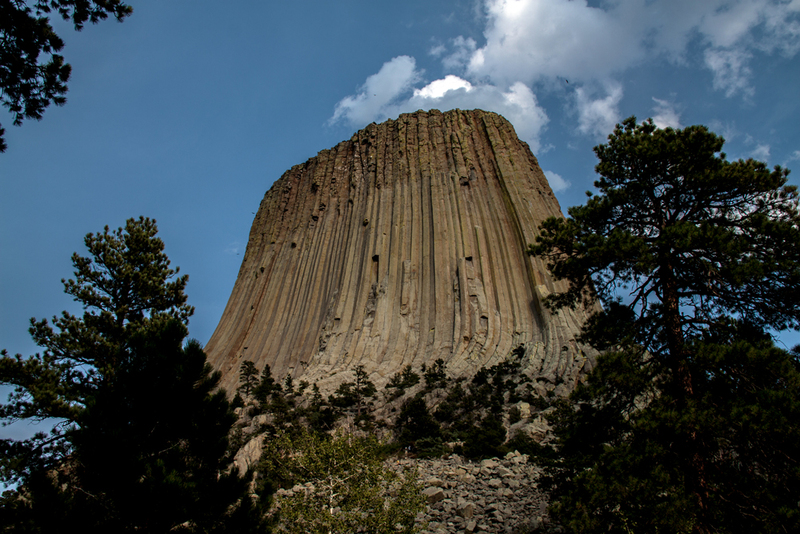 Anyone who saw Close Encounters of the Third Kind knows about Devils Tower. Richard Dreyfuss demonstrates considerable skill in sculpting a replica Devils Tower from mashed potatoes. And about that name – it is Devils Tower, not Devil’s Tower. Conceivably, it makes more sense for the monument to be titled Devil’s Tower – one devil possessing a tower. However, when the original proclamation was published for this national monument, the apostrophe was accidentally left off. Oops. 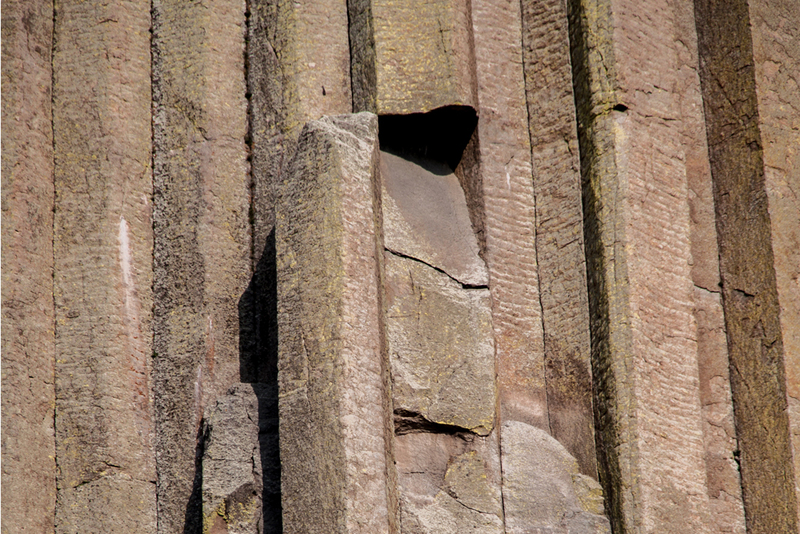 From that day on, the monument is Devils Tower – many devils somehow associated with a tower. We arrived in Sundance with plenty of time to visit Devils Tower. It was a long-ish drive from our RV park, but there was plenty of daylight when we arrived. We were content to walk to the base of the monument and sit for a while contemplating the weirdness of the rock. There is absolutely nothing else anywhere around the formation that looks even remotely similar to it. Some visitors are more energetic than we were. We saw a group of young men with technical climbing gear, preparing for an ascent in the late afternoon. Presumably they would heed the caution not to climb on crumbling parts of the monument. After our visit to Devils Tower, we used the trusty TripAdvisor app to find a restaurant for dinner. The burgers were just dandy. We noticed a trophy sitting by the cash register, applauding the “award- winning” biscuits and gravy. We decided to return the next morning, before our departure for Custer SD. We were quite excited about trying the “award-winning” biscuits and gravy. However, we did not find them to be impressive.